Staff Sgt. 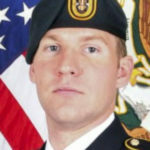 Matthew V. Thompson, 28, of Irvine, California, is killed during an anti-Taliban operation near Lashkar Gah, the capital of the southern Afghan province of Helmand. The Army Green Beret was on a foot patrol with other American troops advising Afghan special operations forces where the Taliban have engaged in heavy combat. Thompson is killed by a bomb blast that leaves another American service member and six Afghan soldiers injured.